If you didn’t know, almond is one of my favorite flavors when it comes to dessert. Give me an Almond Croissant for breakfast and I am a happy camper – although that’s not really a dessert item, but, it could be. LOL! 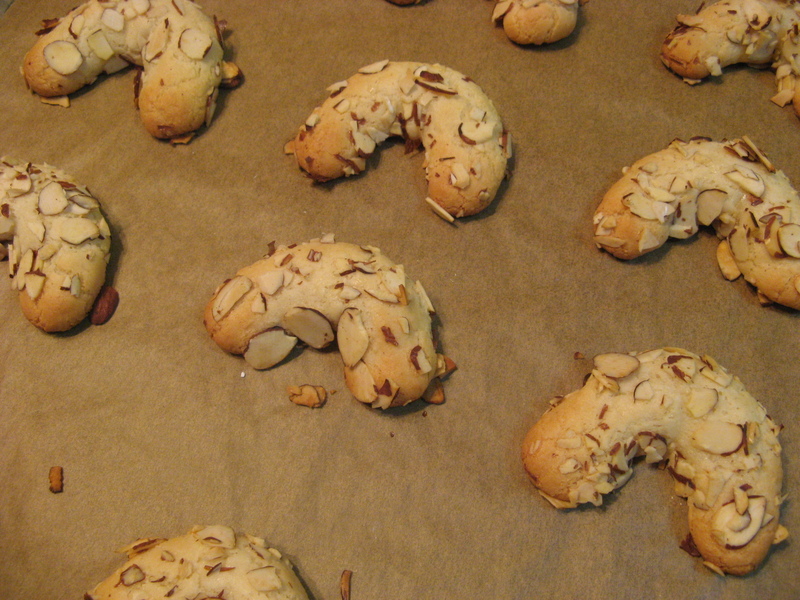 Since I am a fan of almond I regularly get the Odense Newsletter that features recipes using their almond paste. 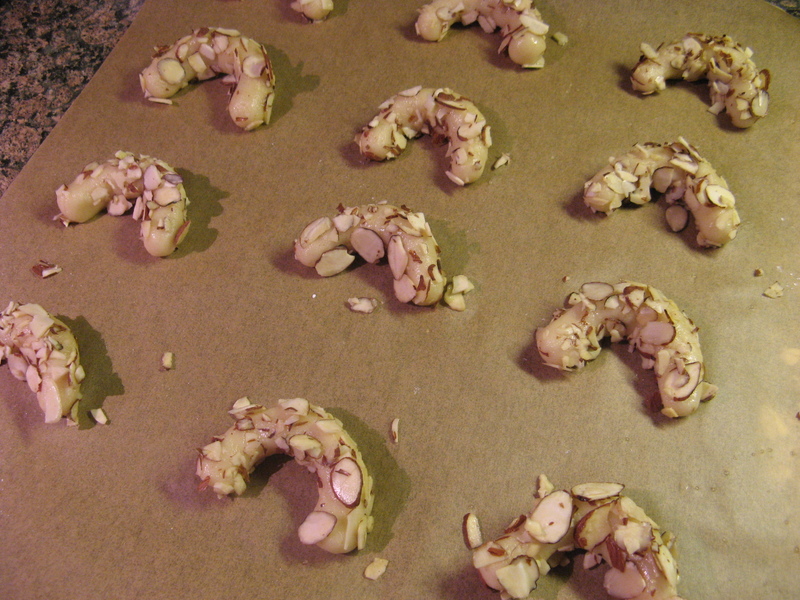 In their latest newsletter they had a recipe for Almond Horns that were super simple, I had most of the ingredients on hand and I figured it was time to bake something sweet. To make the dough I broke the almond paste into small pieces and added it to the bowl of my food processor along with confectioners’ sugar. I mixed the two until it was the texture of fine crumbs. I then added in an egg white (reserving the yolk) and almond flour. I continued mixing the dough until it became a smooth paste. 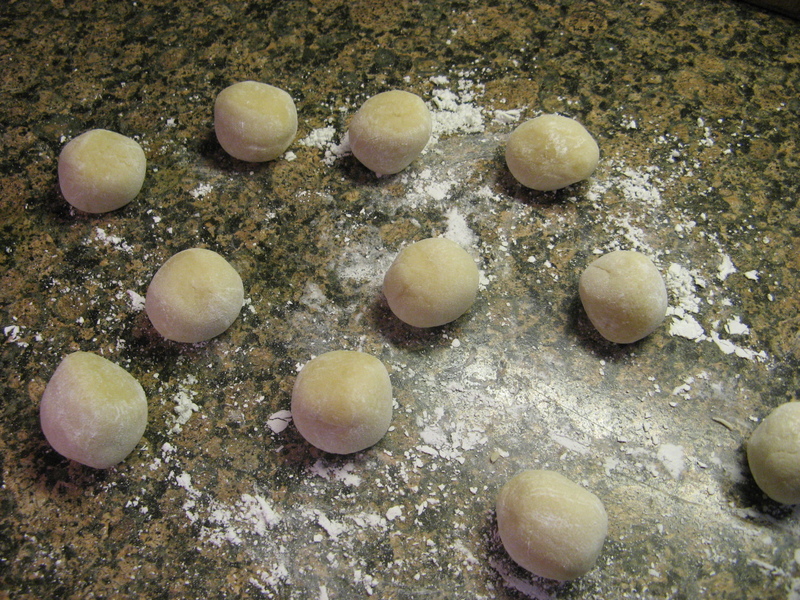 Next I turned the dough onto my counter that I dusted with confectioners’ sugar and rolled the dough into a 12-inch log and then divided it into 12 equal pieces and rolled each piece into a ball. After that I rolled the balls into 3-inch logs that were slightly tapered toward the ends. I added water to the reserved yolk and beat the two and spread thinly sliced almonds, which I crushed slightly, on a plate. 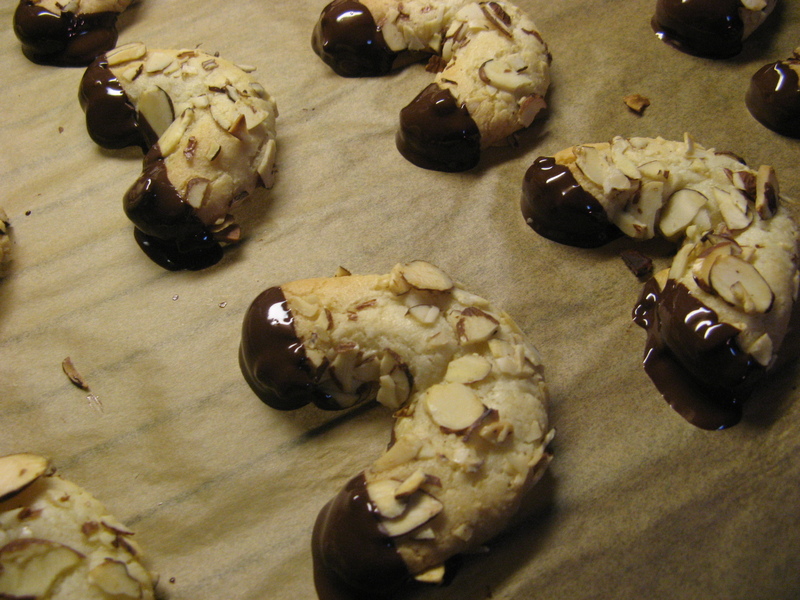 I then dampened the logs in the egg yolk and rolled them in the almonds bending them into crescents and placed them on a parchment lined cookie sheet that I then placed in the refrigerator for 20 minutes. While the Almond Horns were in the refrigerator I preheated the oven to 350F. After the 20 minutes, I baked them for 14 minutes and then let them cool completely on a wire rack. Once they were cooled I melted bittersweet chocolate and dipped the ends of the horns in. These are so good and so easy and quick to make. The outside is crispy while the inside is moist and chewy. Using a food processor or mixer combine the almond paste and 3/4 cup of sugar. Mix until the texture is that of fine crumbs. Add the egg white and flour and continue mixing until the dough becomes a smooth paste, it will be slightly sticky. Turn the dough out onto a confectioners’ sugar dusted work surface and roll into a 12-inch log. Divide the log into 12 equal pieces and roll each piece into a ball. Roll the balls into a 3-inch log that is slightly tapered at then ends. 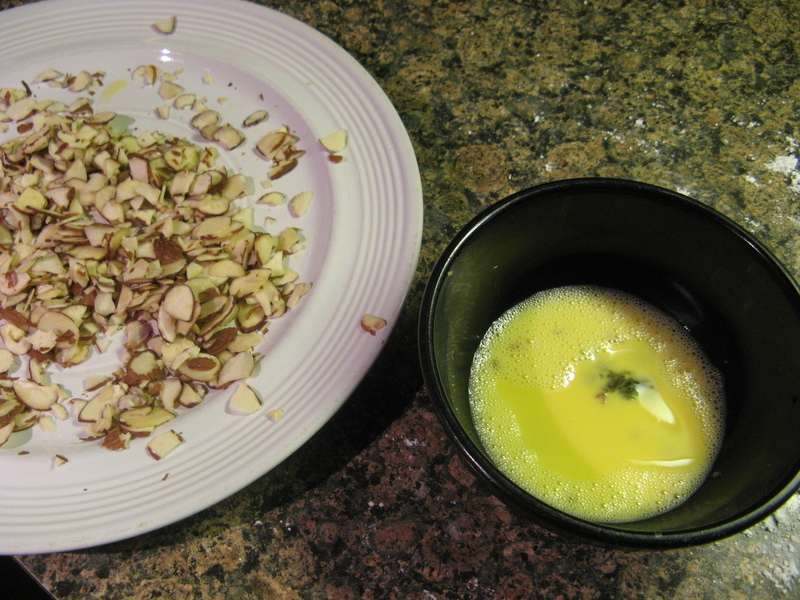 Spread the almonds on a plate and beat the egg yolk with 2 tablespoons of water. Dampen the logs in the yolk mixture and then rolls in the almonds shaping the logs into a crescent. 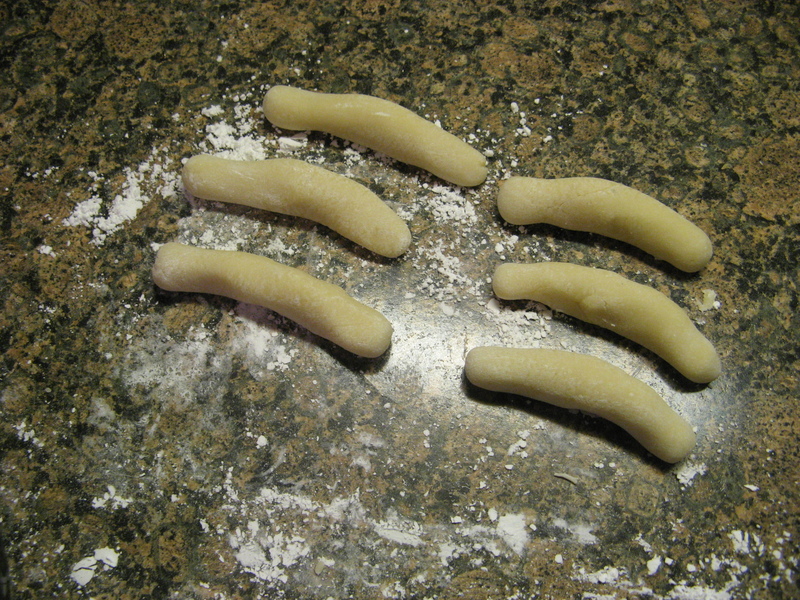 Place the crescents onto the prepared cookie sheet 2-inches apart and refrigerate for 20 minutes. Bake 14 to 16 minutes, until lightly golden. Cool the cookie sheet on a wire rack for 5 minutes and then slide the parchment paper off of the cookie sheet and onto the wire rack so the cookies can cool completely. Once cooled melt the chocolate in a double boiler or in the microwave. Dip the ends into the melted chocolate and return to the parchment paper so the chocolate can set. Layer the cookies between sheets of wax paper in an airtight container for up to 5 days.